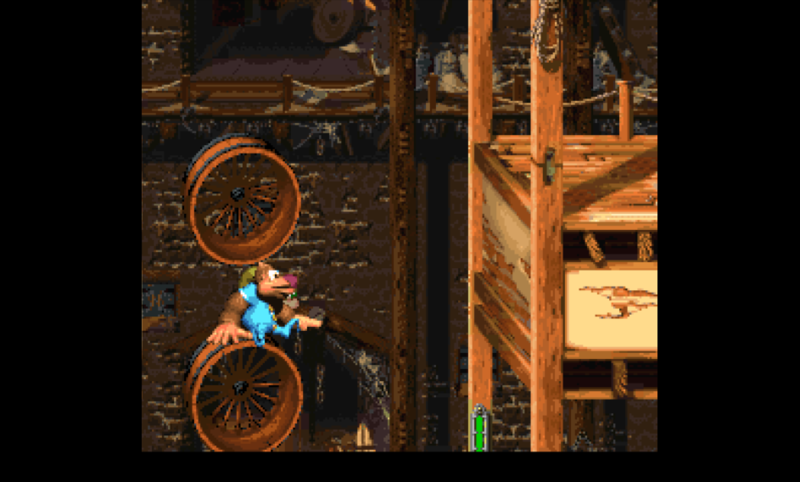 Hello guys, one year after releasing my first rom hack Donkey Kong Country - Kremlings Revenge Remodel, I’m really pleased and proud to show you my new rom hack : Donkey Kong Country 3 - Tag Team Trouble. It was entirely made with SDK3 Editor, Platinum and Frontend from Kingizor (thank you for that tool) ! Those tools are really complicated to deal with, especially when you don’t want to have glitches and bugs in the game, so that was really a hard task : sometimes you imagine gameplay phases, which you cannot implement in the game because it does not work, or it lags or glitches etc… In consequence, it took me around one year of hard work to achieve this result, so please be kind and say thanks if you play the game and like it ! All the levels have been entirely modified, with new level design, enemies, objects and bonus placement ! Boss and map are the same as the original. This game’s overall difficulty is the same as the original. A big part of the interest of this hack resides in finding all bonuses and DK coins. The number of bonus levels in each level is the same as the original. Will you be able to reach 103 % ?? Good luck, and enjoy !!! I've been really enjoying this hack so far, it has great level design, but I think there may be a huge error in one of the levels. In "Squeals on Wheels" I cannot find the final squeal to kill in order to open the gate at the end. Perhaps I am being really bad at finding it, but if it is indeed missing then the level is impossible to beat. I can tell you there is no mistake in this level, I think your missing squeal is on top of two squeals, you need to have two kongs and to follow the bananas up ! Do you mean this one? (With a third squeal at the top right) I tried to go everywhere, perhaps entering a bonus messed with the spawns or the counter, I've looked over the entirely level 3 times now and I've gotten everything I think. This certainly looks interesting, L_Sky. I'll keep your creation in mind as I progress through the future. OneOf99, do you have 10 squeals in the second part of the level (after mid level barrel) ?? Nope, I only have 9. I've found the dk coin and the red balloon at the end past the two red zingers so I must say I am quite unsure of where to go. Here are the placements of the 10 squeals of the second part of the level. I re tested for the hundred times and this worked for me again. Tell me if not for you. Ah, I was missing the one on the top of the three on the right! Thank you for the help! I would recommend changing that one because the single banana isn't suspicious enough as to a clue about getting up there, maybe just include it along that long platform with the twin enemies. The thing is that at that place, there is normally an up arrow to signify you need to go up (near the DK barrel), can't you see it ? There is only a single banana for you ? Excellent room hack so far! impressed with your work! A question : can you see the up arrow bananas in squeals on wheels level (see picture above) ? It's nice to see my favorite game of the SNES trilogy get a rom hack. I'll post more about my thoughts on it when I complete everything (the new Lightning Look-out and Swoopy Salvo may make me instantly hate it), but so far I've played the first two worlds and I'm really enjoying it! It's nice to see some of the more underutilized elements of DKC3 get more use (Squitter, the toboggan, Kuff 'n' Klout, Kobbles). Something weird I noticed was that on Springin' Spiders there were 3 Swoopy holes close together on one of the trees but no Swoopies came out of them. What's up with that? Correct me if I'm wrong, but I think this is the first complete rom hack of DKC3. 3 years ago I downloaded all the necessary tools to make edits to DKC3, saw how complicated it was, and just gave up. Props to you for managing to actually make one! The swoopy holes and are only for design, not for gameplay, so no swoopy will come out of here ! Well, I finished the hack 103%. I found a few bugs and things that bothered me which I'll post in a separate comment. Overall, I thought it was pretty good. My favorite levels were the ones that got really creative with the gameplay elements (The toboggan at the beginning of Tidal Trouble, Squawks in Lemguin Lunge, Minkeys in Konveyor Rope Klash). I also liked the levels where the aesthetics and level layout were heavily changed up like the Riverside levels in World 2 focusing more on the water than the originals. The worst levels in the hack for me were the ones which felt pretty much the same as the originals despite altered layouts (Ripsaw Rage, Poisonous Pipeline, Rocket Rush), but I still enjoyed them because I liked the originals. I give you props for actually incorporating water levels in the game instead of cutting them out to save space like other hacks. Overall, the game feels slightly easier than the original but it still is enjoyable. The only level that I genuinely disliked was Swoopy Salvo. You're given a bonus barrel on a silver platter right at the start, the Squawks section is pretty simple to navigate, and the second half features no challenges at all. It was cool to see a vertically firing Bazuka in the second half, but you just go up its kegs and then you're at the end. There's no enemies to dodge or blow up like you had to do in Criss Kross Cliffs. The whole second half feels like you wanted to do something cool with the Bazuka but ran out of time or space and just decided to go on to developing the next level and leave it as is. It brought a smile to my face to see barely used gameplay elements like the Kuchukas, Nids, and Minkeys be used in 2 levels instead of 1. Using barrel cannons to navigate portions of levels like the first 2 DKC games was a nice touch, but I feel that the Tracker barrels were used a bit too often. However, some elements I feel were underutilized like Ellie the Elephant and Parry the Parallel Bird. There also were some levels whose titles don't really fit because the level gimmick was altered. Doorstop Dash doesn't need you to pull switches and rush to get into the closing doors, Lemguin Lunge only features Lemguins at the very end, and Swoopy Salvo only uses Swoopies in the bonus rooms. The bonus barrels were mostly well hidden and fun to find, but I didn't like the ones you found just by walking through the levels normally with very little challenge to get to them. With how every level design is changed up, it weirded me out that the bonus rooms were pretty much the same, even though there were a couple of them that were changed because of animal buddies you entered them with. Overall, I'd say the hack is pretty well made. It's impressive what you did with just the base elements from DKC3 and not retexturing or changing the palettes of levels. It's set the bar decently high for future DKC3 hacks. This post is list things that bothered me while I was playing Tag Team Trouble. Images are included for most of my issues. There are Swoopy holes in the levels Springin' Spiders and Swoopy Salvo despite no Swoopies coming out of them. This made me sad. There are Bazza holes in Bazza's Blockade which have no Bazzas coming out or entering them. There are also holes with Bazzas in which the entrance and exit holes don't line up. The layering of Bananas in the Waterfall levels is off. They appear to be behind the waterfall but can be collected when you're in front of the waterfall. There's a wrong graphic on the docks in the beginning of Kreeping Klasps. There is a part of a house that is attached to the pole that you go behind when you pass by it, but it should match up with the dock like it does in other levels. Also in Kreeping Klasps, I found a weird glitch underneath the long rope after the N. I've seen it be a messed up Buzz, a Klasp, the bonus barrel logo, and a few stray pixels. This may be an emulator issue but I'm not sure. I found a similar Glitch on Tracker Barrel Trek by the barrel for Koin. I found weird eye things in the snow wall in Lemguin Lunge. This made me slightly creeped out. I was able to take Squawks back to the start of Lemguin Lunge and he made the first bonus area a joke. I don't think this was intentional. The last Koindozer in Koindozer Clamber will walk of its platform and hover in midair if you start walking right while on top of him. I found this amusing. In Swoopy Salvo I got stuck in the upper left hand corner right above where the first Bonus Barrel is located. I had to reload an old save state to get out. - Swoopy holes in the levels Springin' Spiders and Swoopy Salvo : here only for design. - Bazza holes in Bazza's Blockade which have no Bazzas coming out or entering them : that's the goal, to confuse player. In addition ot that, Bazza are difficult to use and it was not possible to place them wherever I wanted. Bazza holes not centered with others and not used are also here for design. - Weird eye things in the snow wall in Lemguin Lunge : here only for design. - Take Squawks back to the start of Lemguin Lunge and he made the first bonus area a joke : not a problem, untouched. Concerning Swoopy Salvo, I'm sorry, but the second part of the level is only there to reward the player to have reached the end of the game, giving him a maximum of baloons to perform the last level without difficulties. Concerning levels whose titles don't really fit because the level gimmick was altered, I'm not able to modify it because my programming skills are too weak. If you want to help, you're welcome. However, there is one banana in Rocket Barrel Ride which is still layered wrong. It's found underneath the checkpoint and bonus barrel. I couldn't see the glitch in Tracker Barrel Trek anymore and I like the changed steel keg placement because it makes the Koin puzzle a bit more challenging. I'm sorry if I sounded a bit too negative in my Swoopy Salvo complaints. I guess I didn't like it because it felt out of place and I've never had problems with Rocket Rush. I spent the better part of this morning trying to figure out how to change level names. I explored every part of the SDK3 editor but came up empty handed. I know that there are DKC2 hacks that incorporate changed level names so I decided to see if the SDK2 editor was different. It turns out that SDK2 editor has more features than the SDK3 editor, and of course one of those features was changing level and world names. So I guess the level names that don't fit will stay unless someone is able to incorporate a similar feature in the SDK3 editor. lukefsje, can you tell me something : can you see the up arrow bananas in squeals on wheels level (see my post from August 10th, 2018, 5:41 pm) ? Also, in Kreeping Klasps, can you confirm that the glitches don't appear anymore (glitches were due to Niblas positions) and if you see Niblas instead of the glitches ? I can see the up arrow of bananas clearly in Squeals on Wheels. In Kreeping Klasps, the glitch is gone and there are red Kocos where the glitch was, not the red Nibblas that chase you. I don't know if you meant to say Kocos in your last post or if there should be Nibblas in the level. OK for the up arrow thank you. - The first zone is were there is the first rope. - Second zone is under mid level barrel and all along the ropes after it. - Last zone is at the end of the level, from DK barrel to "No Nibla sign". Can you see all these Niblas correctly ? In place of previous glitch you were first telling me, I put two red Kocos indeed, because Nibla always glitched at this place. Hello guys, lukefsje seems not to be there to answer me, so can somebody else do it ? My question was : Can you see all the Niblas from Kreeping Klasps described in my last post correctly ? Sorry for being so late...I just started a new year of school and things have been pretty hectic and I forgot about your comment. The first two Nibbla zones work fine, but the third one will only show up if I jump for the DK barrel. If I just walk off the platform before the barrel then it won't show up. @L_Sky: Congrats on the release. DKC3 is probably my favorite game from the original trilogy, so I'm really glad to see that someone's created some new levels for it. I'll try to provide some more feedback after I complete the hack, but there are a couple issues I noticed. First, I had trouble finding the top-right Sneek in Squeals on Wheels. I spent forever trying to find it, and I eventually concluded that you had probably made a mistake. I was actually going to download the level editor and take a look at the stage until I saw you had posted a map of the level here. Obviously this isn't a bug or anything, but I think you may want to add a more obvious hint for this Sneek so that you don't frustrate players, especially since it looks like I'm not the only person who had trouble finding it. Second, in Bobbing Barrel Brawl, when you trade Squawks in for the Steel Barrel that's used to kill Koin, the barrel sometimes ends up in the water to the right of Koin before you have a chance to grab it. The first time I tried to kill Koin, the barrel just flew off to the right when it spawned. The second time, I tried approaching the No Squawks sign from a higher altitude. This time, the barrel landed on the ground near Koin, but it entered the rolling animation and fell into the water before I had a chance to grab it. You may want to slightly adjust the design of this part of the stage to make getting the barrel less frustrating.